Alhambra HS Wins Prestigious Golden Bell Award for Moor Friends! Alhambra High School just won a prestigious Golden Bell Award for its Moor Friends Program! Moor Friends was founded on the premise that help nurture a growing culture of establishing long lasting friendships across the student body. The groups helps to forge unique partnerships and bonds between general education and special education students. Teachers Melissa Martinez, Wendy Osawa and Jamie Peralta spearhead the program. 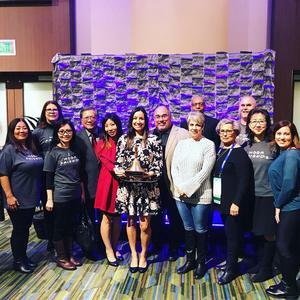 In its 39th year, the Golden Bell Award honors public school programs innovation, sustainability, and best practices that facilitate positive student outcomes.